An excellent addition to Canon's L-series collection of lenses, the TS-E 90mm f/2.8L Macro offers outstanding optics, reliable performance and refined design, featuring the quality professionals and advanced photographers demand. Engineered to complement Canon's high-resolution camera sensors, it's poised to deliver phenomenal image quality in any number of applications. With a large f/2.8 maximum aperture, the TS-E 90mm f/2.8L Macro is extremely bright, excellent for composing images and for quick shutter speeds ? even at low ISO speeds. This means striking portraits, minimized movement even in windy conditions and high flexibility for low-light situations. The TS-E 90mm f/2.8L Macro is designed to deliver the image quality necessary for detailed, high-resolution image capture. A UD Glass lens in an 11-element optical formula helps to minimize chromatic aberration. The TS-E 90mm f/2.8L Macro's optics deliver gorgeous, high-resolution images with sharp edge-to-edge detail. To help minimize the ghosting and flare that reflected light can cause on image capture, the TS-E 90mm f/2.8L Macro features Canon's ASC coating. Air Sphere Coating (ASC) technology is designed to help significantly minimize reflections, particularly with light that enters the lens vertically. It adds a protective film that includes air spheres over the lens's conventional multi-layer coatings, reducing reflections and delivering clear images with high contrast and minimal glare. For greater ease of use, the TS-E 90mm f/2.8L Macro features enlarged knobs for fast, intuitive control of tilt and shift. Feel free to make adjustments as you please without having to take your eyes off the composition. 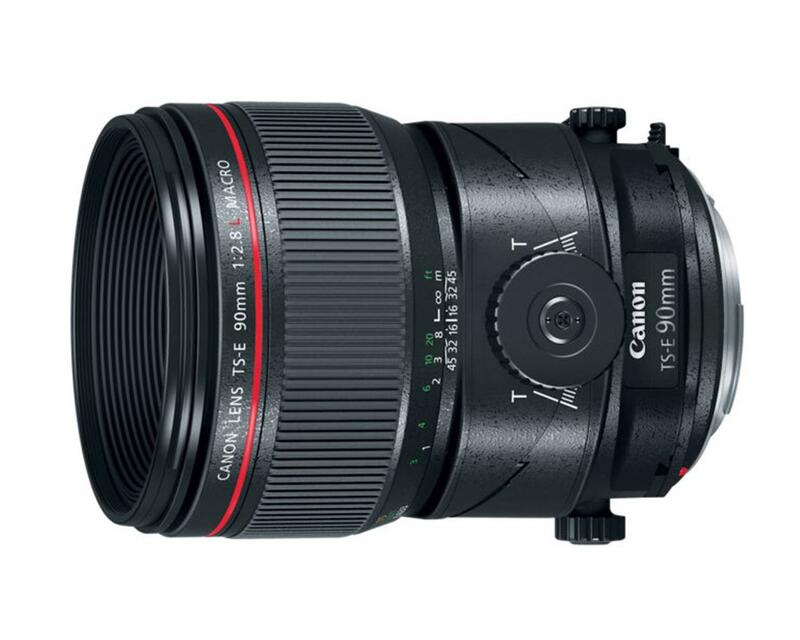 To deliver high operability, the TS-E 90mm f/2.8L Macro features large tilt and shift lock knobs and a rotation lock release button. It also has a tilt-locking mechanism that keeps the lens in the zero position, helping to prevent unintended movement when in use. For greater flexibility in shooting, the TS-E 90mm f/2.8L Macro has an enhanced tilt range of +-10 degrees to deliver a higher level of control. Whether focusing on a subject not parallel to the camera's sensor, increasing or decreasing the lens's depth of field or establishing a specific plane of focus, the TS-E 90mm f/2.8L Macro's enlarged tilt range can prove indispensable in defining the composition. For expansive control, the TS-E 90mm f/2.8L Macro features an incredibly large shift range of +-12mm, enabling seemingly impossible image capture with ease. This increased range helps the TS-E 90mm f/2.8L Macro eliminate converging lines, reflections or nearby objects from the composition, recompose the image without moving the camera and even capture a wider angle of view through photo stitching. With a minimum focusing distance of 16 in./0.39m, the TS-E 90mm f/2.8L Macro is incredibly well-suited for close-up photography. Combined with its expanded range of movements, its minimum focusing distance helps make sharp and detailed close-up images with specifically defined depth of field a reality. Thanks to a maximum magnification of 0.5x, the TS-E 90mm f/2.8L Macro is well-suited for capturing images of small objects. Whether shooting photos of still life, product photography or anything in between, its combination of maximum magnification, close focusing distance and expanded movements enables a truly phenomenal level of control for even the most challenging subjects.